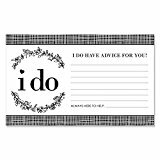 These Wedding Advice Cards are printed on heavy card stock. Wedding Wish Advice cards are perfect for leaving a special message to the happy couple on their wedding day. Whether you are hosting a bridal shower or a ladies-only event to honor the new bride-to-be, everyone is ready to offer their best advice. I Do Wedding wishes cards are a great way to get everyone involved in the bridal shower or to have at your wedding for you guests to leave a special message for you. Advice cards will give your bridal shower guests a chance to write down their best helpful hint for the Bride-To-Be. The couple will appreciate the advice and wishes cards for years to come and they will be an amazing addition to a wedding scrapbook.